Nova (Richard Rider) is a fictional character, a comic book superhero in Marvel Comics. Upon becoming a member of the galaxy's Nova Corps (an intergalactic police force), the youth gained enhanced strength, flight, injury resistance, and a specialized uniform with life support. Ability to exert influence over gravitational forces and open wormholes. Origin: A dying member of the Xandar Space Corps directed his energy to Rich Rider, a teenager living in Hempstead, NY. Later during his tenure in the New Warriors the Rider family lived in Queens, New York. below, praying whomever he found will take up his cause and prove worthy of the powers he had given. Rider gained great strength, invulnerability, the power to fly, and a uniform with a sealed life support system, but little instruction on how to use these new powers. Still, he took up the life of a superhero, fighting costumed villains in New York and gradually learning how to use his new powers. After a brief career as "Nova, the Human Rocket," he was called into space to serve in the protection of the recently reconstructed planet Xandar, the same world where his great powers originated. Eventually tiring of a life of constant intergalactic war and hoping to rejoin his high school friends, the boy requested to return home to Earth. When he was told he had to relinquish his powers in order to do so, Rider agreed. For a time, Rider lived a relatively normal life, flipping burgers, and barely making ends meet due to his disrupted education. He spent his time trying to pick up the pieces of the life he had left behind, all the while wishing he could find a way to regain the powers he lost. Unknown to him, during this period, the planet Xandar was destroyed again in an attack by the space pirate Nebula. After returning home from Xandar, Rich led a listless life. Depressed by the loss of his powers, and unwilling to go back to a high school that all his friends had graduated, he worked odd jobs until the day he was kidnapped by Night Thrasher. Dwayne Taylor was attempting to build his own super-hero team, and had read Richard Rider's analysis that Rich's powers might be reactivated if he suffered a great enough adrenaline rush. In order to accomplish his "experiment," he kidnapped Rich and dropped him from the top of a building. His powers were then reactivated, and after his initial anger at Dwayne, he eventually agreed to join his team. Nova proved to be a valuable asset to the Warriors. The most experienced of all the heroes, he took the very inexperienced hero, Speedball, and helped develop him as a member of the team. He was also invaluable in the team's fight against the two Sphinxes, villains of Rich's past. 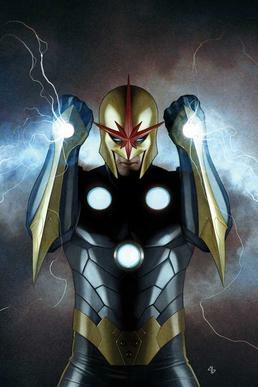 At the height of the New Warriors' popularity, Nova was spun off into his own book, which focused on the difficulty he had in maintaining his duties as both a member of the Nova Corps and the New Warriors. 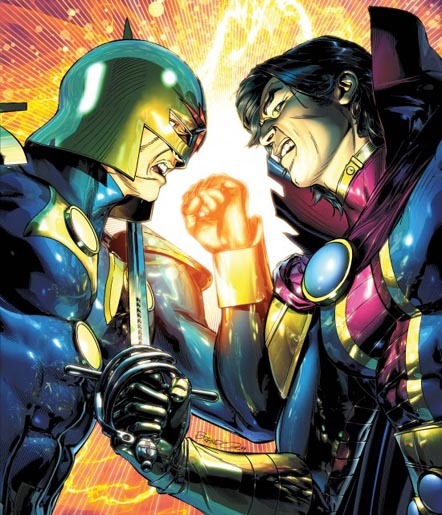 During this series, he met an alternate reality Nova, "Nova O:O," who helped Rich develop his powers. He also saved the Earth from destruction by preventing the "Deathstorm" bomb from going off. 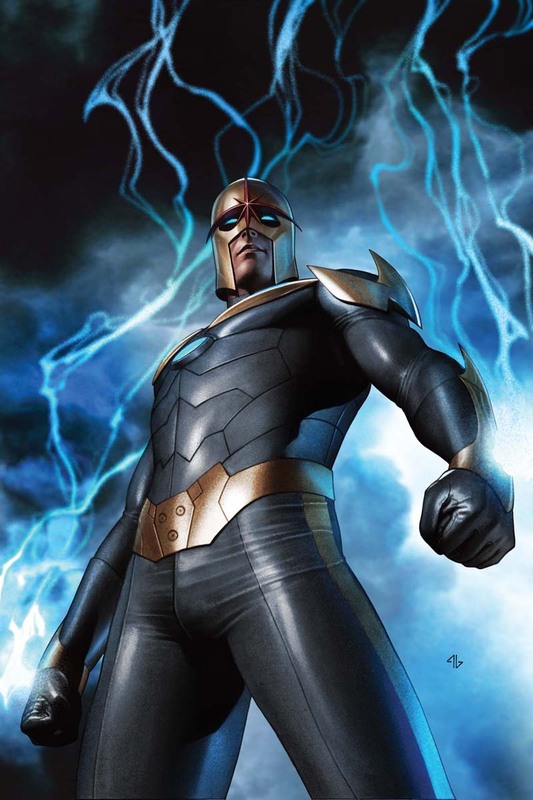 Eventually, another Nova, Nova (Garthan Saal), took over Rich's duties, and for awhile he was without any powers. From the first time they met, it was clear that Richard and Nita Prentiss (Namorita) had a certain rapport. This bloomed into a romantic relationship, although a somewhat strained one at that. When Nita underwent a change, turning into the blue-skinned Kymaera, Rich was there for her, not caring about her change in appearance. Later, Rich began a separate relationship (in his civilian identity) with a girl named Laura Dunham, although they drifted apart when she found out about his superhero activities. Nova and Nita continued their relationship, but it fell apart in the pages of Nova's third series. Nita, undergoing another change in appearance/powers, needed Rich's support, but he turned away from her because of his own personal problems. Rich later became jealous of Nita's relationship with Johnny Storm (the Human Torch), and almost began his own relationship with Mickey Musashi (Turbo). Most of the Nova Corps and New Xandar had been destroyed by the Annihilation Wave. Richard now contained the Worldmind, giving him substantially increased power in order to battle the threat. However, it is not known how long he could contain the Worldmind. Drax had offered to assist him. Later, in an effort to buy more time for the evacuation of the besieged planet Nycos Aristedes, Nova and Quasar punched through the Annihilation Wave to meet Annihilus face to face on his own command ship. In the ensuing battle, Quasar was killed and, though Rider was forced to flee, his efforts, combined with the timely intervention of the Worldmind, succeeded in driving the Annihilation Wave to retreat from the sector and secure the planet's complete evacuation. Faced with the universal threat Annihilus now posed, Rider and the Worldmind agreed to abandon the search for a safe haven and remained joined together to fight the Wave head on. 205 days after Annihilation Day, Richard Rider formed an army, the United Front, to oppose the Annihilation Wave. His land-based army included Drax the Destroyer, Gamora, Ronan the Accuser and Starlord (Peter Quill), while his outer-space forces consisted primarily of Firelord, Red Shift and Stardust, former Heralds of Galactus. Rider and his forces fought valiantly holding off the wave as best as they could gaining small victories here and there. Other allies joined the United Front like Super Skrull and Phyla-Vell. The Front was made up of hundreds of species all fighting to stop the Wave. After months of fighting Nova finally confronted Annihilus and the two began a fierce battle. Phyla-Vell attempted to join, but finds that Nova had sealed her and Quill in an energy bubble, wanting to face Annihilus alone. Using the quantum bands, Annihilus proved to be too much for Nova. Phyla-Vell forced her way out of the bubble and attacked Annihilus, attempting to wrest the quantum bands from him. Annihilus threw her aside, but the quantum bands abandoned Annihilus and joined with Phyla-Vell. Annihilus fought on, but Nova surmised that the gap in Annihilus' armor was his mouth, forcing his hand down Annihilus' throat and tearing out his insides, yelling "This is for the Nova Corps!!". Both Annihilus and Nova slumped to the ground as Nova looked up to see the veiled figures of Thanos and Lady Death looking over him and smiling. Nova told them "Better luck next time". The war was over, Annihilus' forces were defeated and treaties were signed. Ronan now Emperor of the Kree offered to make Nova an honorary Kree. Nova was left debating his future and wondered if he should return home to Earth. Richard and Worldmind went to maintain the duties of the Nova Corps by himself, but got overwhelmed by his sense of duty. As he recklessly tried to shortcut one of the mission travels, he ended up crashing on Earth in wake of The Initiative. He went to his parents, learning about the Stamford incident, involving the New Warriors accidentally causing the death of 612 people, most of them children, while chasing supervillains. Then suddenly, S.H.I.E.L.D. steps onto the front lawn, having presumed Rider to be an extra-terrestrial threat due to his high power level. Hostilities calmed down when Iron Man, current Director of S.H.I.E.L.D., recognized him. On the Helicarrier, they both talked about their respective wars that they've fought. Iron Man asks him to register with the Initiative, stating that him being a New Warrior and displaying unmatched discipline and responsibility, which the Initiative was striving for in their superhumans, could revise the public's current issues about superhumans and redeem the New Warriors. Rider asks for 24 hours before he makes a final decision. He then meets Justice on the launch deck, who also asked him to join the Initiative. However, while Rider slept on it, Worldmind secretly took over his body, frightening his parents. By morning, he decides to show Worldmind his hometown, when he is attacked by Diamondhead, who had been waiting since Stamford for him to return. He manages to subdue him but after turning his foe in to the police, he is confronted by Thunderbolts, the government's unregistered superhuman hunters. The fight was shortly stopped by Iron Man, and he given a short tour to Richard's old school, where they debated the different ideologies between common purposes and abuse of powers. When he returned home, Richard's parents thought that he was crazy and asked him to register and get himself "looked at" by S.H.I.E.L.D., but he just didn't know what to do. Penance, revealing himself as Robbie Baldwin, came to his house, and urged him to register, to make things better, but Richard thought that his world had gone insane. Saying his goodbyes to Penance and his parents he eventually went back to his Nova Corps duties. encountered a contingent of Phalanx-possessed Kree Sentries that attacked him without provocation. The Worldmind reported that these Sentries were carrying viral programming that was nearly succeeding in invading its own systems. Cutting and running, Rider attempted to open a stargate and flee, only to impact at full speed against the energy barrier the Phalanx were using to seal off Kree space from the rest of the universe, mortally wounding himself in the process. Flung to a planet on the far edge of Kree territory, Rider's charred body came to rest in a crater near the encamped survivors of a downed Kree vessel. Working quickly to protect its host's remains from incoming Phalanx attackers, the Worldmind chose Ko-rel, a female commander of the former warship, conferring on her the powers and rank of a Nova Corps Centurion and the designation Nova 0001. Nearing death, Rider was transported to the safety of Ko-Rel's ship to give his suit's healing systems time to attempt repairing his broken body. Later, the Phalanx Select Gamora sneaked on board the ship and infected Rider with the Phalanx transmode virus, accelerating his recovery and making him a Select. Now a slave of the Phalanx, Nova rekindled his affair with Gamora, and spent a brief time as a Phalanx Select. Tasked with killing Rider before the Worldmind could succumb to the transmode virus, thus allowing the Phalanx full access to the Nova Force, Ko-Rel attacked him, guided by Worldmind's fast thinking. But once she incapacitates him, she hesitates to finish the job only to be killed by Gamora in retaliation. Upon Ko-Rel's death, the remainder of the Nova Force transferred back into Rider's now fully healed body, enabling him to contain his transmode virus infection and break free from Phalanx possession. Fleeing, Nova utilized the gravity of a nearby neutron star to create a wormhole and escape. In hot pursuit, Gamora and new Phalanx Select Drax followed Rider into the wormhole. technology, Rider made his way to Kvch. However, Gamora and Drax follow him. Eventually arriving on Kvch, home planet of the Technarchy, Rider was able to enlist the help of the mutant Warlock and his son Tyro, who succeeded in completely curing Rider, Drax, and Gamora of the transmode virus before accompanying them back to Hala to engage the Phalanx. Bursting through the Phalanx's recently weakened energy shield, Nova saved Star-Lord's life and aided in the battle against Ultron. After the Phalanx conquest, Rider helped Peter Quill (Earth-616) to start the Guardians of the Galaxy, before he went back to his normal Nova duties. He arrived on a planet that was about to be eaten by Galactus. He helped the people of the planet to evacuate and fought the psionic entity Harrow that was killing the evacuees. Harrow was able to jump from mind to mind, but Nova captured him. Unfortunately the ships that were supposed to evacuate the people were disabled by Galactus' electromagnetic disruption. Nova tried to beg Galactus to wait a few hours so the people could escape but Galactus ignored him. The Silver Surfer (Norrin Radd) then engaged Nova in combat and was able to force Nova down on to the planet, but Nova pleaded for the time to save the people, and the Silver Surfer utilized the Power Cosmic to shield the space ships. Nova returned to find that Harrow had escaped, then he fought it so all the ships could escape. As he was fighting directly under one of the ships, the ship started it`s star drive engines which killed Harrow, and knocked Nova down for a few seconds. When he regained composure, he found himself trapped on the planet. Worldmind blamed him for his carelessness in protecting his gestalt. Nonetheless, Rider was determined to escape before the planet was destroyed. He attempted to use one of the energy siphons to get onto Galactus' ship. Worldmind said that that plan was crazy, but he went through with it. With great difficulty, Rider was able to get onboard Galactus' ship, despite Worldmind going offline in the process. His suit's user support systems then detected the Harrow in its true form: that of a hideous insectoid. He attempted to kill the horrid creature, only for the Harrow to react to him, overwhelming his defenses with his telepathy. Through it, Rider learned that Harrow was hitchiking with Galactus, feeding off the terror while Galactus feeds on a planet. Therefore, he reveals Harrow to the Surfer and Galactus. The latter incinerated Harrow, before teleporting Rider five light years away, possibly out of a gratitude. However, the Surfer warns Rider that Galactus doesn't spare anything twice. The Worldmind revealed to Rider that it had taken control of his body while he was asleep, recruiting individuals to restore the Corps. Though feeling a little bit betrayed that Worldmind was acting behind his back, Rider decided to use the Corps to clean up the fallout of the Skrull invasion, taking down various villains, including the Serpent Society and Dragon Man. But Rider would soon become horrified when he discovers that Worldmind had recruited Robbie into the Corps. And worse, it had lobotimized Ego the Living Planet, to use as a base to restart the Nova Corps. Richard was cut off from the Nova Force after protesting the Worldmind's plan, in which the Xandarian supercomputer claimed to the Corps that the Nova Force had addled his brain. Powerless, Rider decided to go to P.E.G.A.S.U.S. to get examined on whether his mind was affected by the Nova Force. He also requested that they lure in some Centurion to confirm if they are being controlled by Worldmind. The latter proves correct, as Worldmind was using endorphins and subliminal messages to control the Centurions. Worse, he discovered that having hosted the Nova Force for so long had caused extensive damage to his body at the molecular level and he was in a state of molecular decay. He would die within 48 hours. Unfortunately, Project P.E.G.A.S.U.S. was being closed down by H.A.M.M.E.R., just be they could attempt to find a cure. stolen them from Phyla-Vell. Taking the bands, Richard was given a second chance on life and became the new Quasar. Along with Wendell, Rider return to Nu Xandar to retake the Nova Force and stop the forced recruitment. Unfortunately, Ego had a massive cosmic awareness and could not be taken by surprise. Therefore, Rider created quantum copies of himself to make his assault. Once inside Nu-Xandar, he soon discovers that Worldmind did not subvert Ego, but rather Ego had suppressed Worldmind. With Wendell's coaching on how to use the quantum bands, he created a sanctuary, resembling his old room from Long Island, to protect himself. Conjuring up Rhomann Dey and Ko-rel, both remnants of the Worldmind, Rider learns that that when he took Worldmind to help him prevent the Nova Force from making him go insane, it neglected to do the same for itself. The Phalanx virus and the tangle with Galactus only made it worse, making Worldmind unstable, who called out to Ego for help. Rider then sped off to regain the Nova Force. Once he became Nova Prime once more, he lobotomized Ego. Unfortunately, Worldmind had to reboot its personality because of the damage it had sustained. The new interface became Ko-rel. Rider then went off in search of Robbie, who had left to find Xenith, the Shi'ar Praetorian who had massacred multiple Centurions. He tracked him to Kree-Lar, where he managed to defeat Xenith. In the aftermath of the War of Kings, Rider admitted that the galaxy does need the Nova Corps. But knowing that throwing untrained recruits ino the fray would only get them killed, he decided to train the few remaining Centurions as probationers. To assist in this matter, Rider recruited Zan Philo, a MIA Centurion who had returned to his proper universe thanks to the time-space tear known as the Fault. Rider soon learned that his fellow New Warrior Darkhawk was wanted for murdering Lilandra Neramani. While chasing his friend and learning about a Fraternity of Raptors who all resemble Darkhawk, they are pulled into the Fault by their old enemy The Sphinx. In the end of the battle, Rider and Darkhawk return to their universe, unintentionally bringing along the former's lost girlfriend Namorita. Nova temporarily returned to Earth when Steve Rogers asked him to become a part of his Secret Avengers. Nova accepted and was dispatched to Mars to after a second Serpent Crown was discovered on Earth, but he went missing soon after arriving. Nova found the actual Serpent Crown and became entranced after swapping it for his Nova helmet. The Secret Avengers pursued Nova but were not able to subdue him until Rogers put on the Nova helmet, receiving Nova's abilities. Once the Serpent Crown was removed from his head, Nova returned to normal. After heading home, Nova responded to a bank robbery and stopped a gang of intergalactic thieves along with Spider-Man. Rider was alerted by Quasar, who had returned from a scouting mission in the Fault, that the tear led to a Cancerverse, filled with demonic versions of Earth's heroes. He headed to Project P.E.G.A.S.U.S., where Vaughan's counterpart was searching for something on Earth. He chased his quarry all the way back to the Fault, where Adam Magus summoned the creatures of the Cancerverse. In the ensuring battle, the Revengers, dark counterparts of the Avengers, kidnapped Namorita, determining her to be an anomaly. Nova, along with other powerful cosmic beings such as the Silver Surfer, Gladiator, Ronan the Accuser, Beta Ray Bill and Quasar, attacked Sanctuary, the base of the Undying Lord to free Namorita and the other anomalies captured. They succeded, but almost get blown to peices when Sanctuary exploded. Later Nova traveled to the Cancerverse just in time to save the Guardians of the Galaxy from the Undying Lord and his Revengers. When the Cancerverse was destroyed by Thanos who had summoned Death, Nova and Star-Lord remained to prevent Thanos from endangering any more realities. 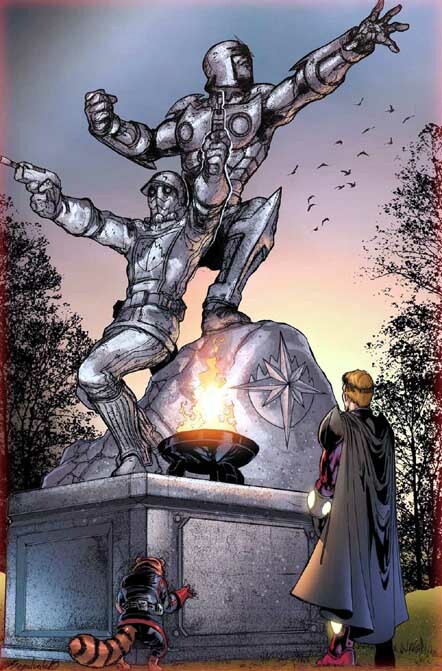 The duo are currently presumed dead, a statue erected in their memory as well as those of the recently fallen heroes and heroines. However, Thanos and Star-Lord were found alive, so there is a huge possibility that Nova is also. Originally, Rider was cocky and humorous, similar to Peter Parker. However, after Annihilation, his personality underwent a drastic change. Richard Rider is the host of the entire Nova Force, a vast energy source that he can apply to grant himself a number of superhuman attributes. 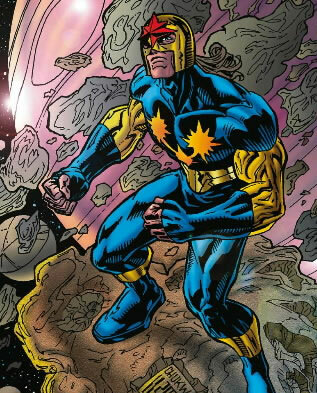 As host to the entire Nova Force, which was previously used to empower all members of the Nova Corps throughout the universe, Rider is now possessed of tremendously augmented strength and durability as well as near limitless quantities of energy that allows him to hold his own against other powerful beings such as the Silver Surfer. Superhuman Strength: Rider is able to channel the Nova Force for the purpose of increasing his physical strength to vast levels. While the full limit isn't known, the Nova Force can grant rider sufficient superhuman strength to lift well in excess of 100 tons easily. The Nova Force makes Rider one of the strongest beings in the Universe. The Nova Force grants Rider sufficient strength and power to even engage and stalemate the likes of the Silver Surfer in combat. He was even capable of going blow for blow with the likes of Annihilus himself in combat, and was able to rip him inside out. Superhuman Stamina: Due to the Nova Forces augmentation of his musculature, Rider's muscles produce considerably less fatigue toxins during physical activity than the musculature of a normal human. While the full limits of his stamina aren't known, he is able to exert himself physically for at least 24 hours before the fatigue toxins impair him. and tremendous impact forces without sustaining injury. While employing the Nova Force, Rider can easily withstand the rigors of deep space indefinitely. He can withstand attacks from powerful beings such as Annihilus, Silver Surfer relatively unharmed. He was able to withstand without any significant damage, the raw energy and power stored in the reservoir in Galactus' ship which contained power siphoned from the destroyed energy of entire planets. He was even capable of withstanding a massive omni-directional blast from an enraged Galactus at near point blank range which was so powerful it encompassed and destroyed more than 3 Solar Systems relatively unharmed. Superhuman Agility: Rider's agility, balance, and bodily coordination are enhanced to levels that are beyond the physical limits of the finest human athlete. Superhuman Reflexes: Rider's reflexes are similarly enhanced and are superior to those of the finest human athlete. Regenerative Healing Factor: In spite of his great physical resilience, it is possible for him to sustain injury. On the rare occasion that Rider is injured he can purposely channel the Nova Force to rapidly heal damaged bodily tissues. The full limits and capabilities of his healing powers aren't known but he was able to heal himself any damage done instantly with the Nova Force. Flight: Rider can use the Nova Force to propel himself through the air at tremendous speeds. Nova is fully capable of achieving faster than light velocities, and often does, while traveling through space. However, moving as such speeds while in the atmosphere of a planet would cause devastation to the planet itself, so he travels much slower while on within a planetary atmosphere, generally at supersonic speeds. create extremely powerful energy attacks. He was able to lobotomize Ego the living planet himself, in one massive attack of energy using the Nova Force which was off the scale. Helps Rider contain the whole Nova Force while keeping his mind and sanity intact. generating capabilities during combat. However, he can access the Xandrian Worldmind and instantly gain knowledge of Xandrian hand-to-hand combat techniques which he sometimes uses in combination with his energy powers. While his strength limit is unknown, he has shown enough strength to easily lift well in excess of 100 tons without effort. He is one of the physically strongest beings in the Universe. Whenever on Earth, Richard is easily one of the strongest and most powerful beings on the planet. Rider uses the Xandrian Worldmind to help maintain his mood and mental stability. Without it, utilizing the full power of the Nova Force would overcome Rider's mental stability, causing a severe mental breakdown and possibly insanity. uniform also contains inhibitors that can manipulate various hormones in Rider's brain for the purpose of moderating his moods as needed. The uniform also has self-repairing capabilities, allowing it to seal rips and tears on it's own. As with past models, the helmet Rider uses with his current uniform resembles and feels like cloth when he isn't wearing it, though it adopts a metallic look and feel when he wears it. Rider can also alter the appearance and nature of his uniform to suit his needs. The helmet contained radio circuitry enabling Nova to pick up radio transmissions, monitor transmissions, telescopic sights, night vision sensors, and heat imaging sensors, as well as overlay a visual heads-up display for tracking energy signatures. The helmet also contains a psynaptic scrambler to use on opponents in close quarters (such as Xenith or Gladiator). Nova's helmet has a rigid construction and shape when worn, but becomes as malleable as cloth when it is not, allowing Rider to hide it in his civilian clothes when desired. Nova, in his responsibility of "Guardian of the Terran Sector" for the Xandar Space Corps, controlled a satellite orbiting the planet. Flight under own power. While member of the New Warriors vehicles supplied by Dwayne Taylor.